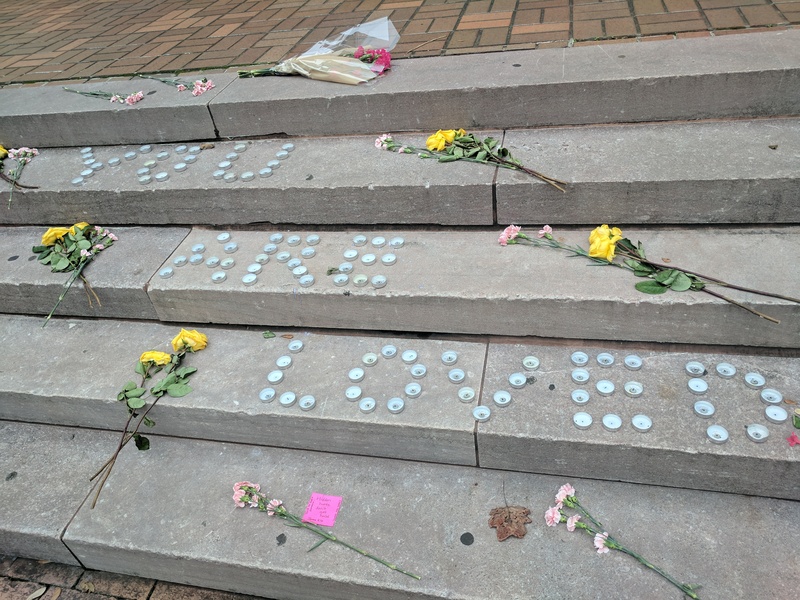 A memorial appeared on the steps of Gambrell Hall after a graduate student committed suicide in October. Campus Student Health Services often struggles to get students engaged in mental health care. It’s hard for many USC students to admit they’re struggling with mental health, especially those coming from a state where mental health services are few and far between. Kaitlin Harrison grew up in a rural community in South Carolina with a population of 1,200. Her graduating class was just about 50. So when Harrison started struggling with depression and anxiety at a young age, her family had to make the hour-long drive from Prosperity to Columbia to get her any mental health services. “Me and my family personally struggled it with because I was really young, and they didn’t know how to deal with it,” she said. She turned to music to help her through her loneliness. Now a third-year public relations student at USC, Harrison was amazed at the array of services on campus. But while finding other people going through the same struggle helped Harrison, it presents a challenge for the university. As Student Health Services staff tackle the challenge of mental health, they have to distribute millions of dollars for traditional care and crisis intervention, not to mention various programs to train students, staff and faculty to understand signs of depression and other mental illnesses. More than 15 percent of USC students are diagnosed with or treated for depression and 20 percent for anxiety, according to campus-specific data from the National College Health Assessment Survey taken in spring of 2017. Those numbers don’t reflect the true scale of students’ struggles with mental health — more than 60 percent reported feeling overwhelming anxiety in the past 12 months, and 55 percent reported more than average or tremendous amounts of stress, according to the survey. All these figures have gone up between five and 12 percent in the past seven years. From the perspective of Rebecca Caldwell, USC’s director of Strategic Health Initiatives, mental health needs to become a normal part of self-care and enter everyday conversation. But about half the student body come from South Carolina, a state ranking 31st in adult mental health care and 37th for children, according to non-profit Mental Health America. Shortly after Harrison entered USC as a freshman, her mother was diagnosed with bipolar disorder. In addition to struggling with repeated hospital visits, her mother faced a lack of understanding from family in Prosperity. Without encouragement and understanding from families, many South Carolina students grow up without ever approaching counseling services. The state requires primary and secondary schools to have counselors, but many are college entrance or career specialists and not trained to deal with mental health conditions. “Our students come from really diverse backgrounds and so I think a lot of stigma does come from the background point,” Caldwell said. Students may have been raised thinking that seeking help is a sign of weakness, she said. Katie Cohen grew up in North Augusta, South Carolina. While a bit bigger than Prosperity, North Augusta struggles with many of the same issues. Harrison and Cohen both came into USC knowing they wanted to get involved with mental health awareness – they didn’t want anyone to feel alone like they had. Harrison joined the USC chapter of Active Minds, a national student-run organization to promote mental health. While not very involved initially, Harrison said that she was inspired to do more after her mother’s diagnosis. She was elected president of the organization this year. Cohen initially tried to organize a campus awareness week through Freshman Council, but it fell through. Her sophomore year, she successfully started a peer-listening program called Gamecock Reach. Student Body President Ross Lordo gave her the position of secretary of health and wellness in his cabinet. And Oct. 9-13 of this year, she organized Stigma Free USC Week with Harrison. The events throughout the week reached over 700 students. “If we have this culture of people who are willing to talk about it, you know, ‘I have anxiety, I have depression,’ then when somebody else starts feeling it they’re not going to think that it’s necessarily abnormal,” Cohen said. Harrison emphasized the positive effect national figures can have on mental health awareness like musician Logic, who recently released “1-800-273-8255.” Calls to the National Suicide Prevention Hotline, the namesake of the song, were up more than a third after the release. After graduation, she hopes to work at a record label because music has played a large part in her own personal coping mechanisms. But until then, she’ll continue planning events on campus like a Nov. 9 candlelight vigil to students who committed suicide and Stress Less Week leading up to exams. The new $30 million Student Health Center opened earlier this year.